I am going to show you how to make a gluten free "pasta" dish by using three vegetables, some spices, and a cool tool called the Spiralizer from Common Sense Goods. This "pasta" is not only gluten free but is also low carb, low in calories and high in fiber. 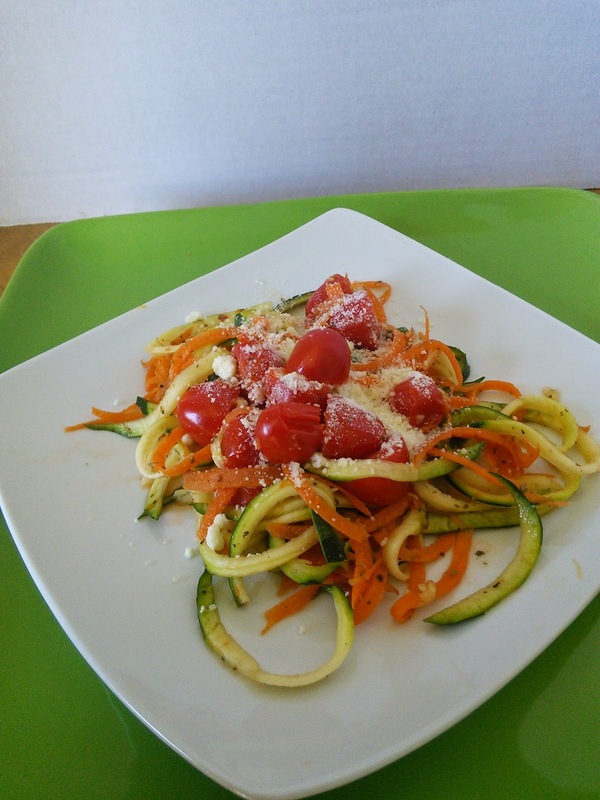 This "pasta" is made from carrots, zucchini and tomatoes. The veggies are made into strips the look like spaghetti by using this vegetable spiral slicer. So what is the Spiralizer vegetable spiral slicer? This cool tool transforms raw vegetables into pasta-like noodles shapes that are the perfect healthy alternative to carb heavy pasta. This veggie pasta is great for people who want to eat healthier, so gluten free, eat paleo, lose weight, or just want to make pretty dishes. This tool will also encourage you kids to eat more veggies. The vegetable noodles are made by spiral slicing raw veggies like zucchini, carrots, cucumbers, or sweet potatoes into long strands that look like spaghetti. I love that this tool is dishwasher safe and made from stainless steel. You can also easily wash the Spiralizer by hand too. I just rinse mine under water and use the includes brush to clean it. It also comes with an ecookbook that has 17 recipes with color pictures that uses the veggie noodles. I can't wait to make the Twisted Thai Salad, Creamy Cucumber Salad, and Salad Rolls. This tool will be perfect for this summer when you garden gives you an abundance of zucchini. To purchase one of these fun Spiralizers, click on the below link. Also the first 25 people can save $10.00, making the Spiralizer at great deal 60% off the regular price. 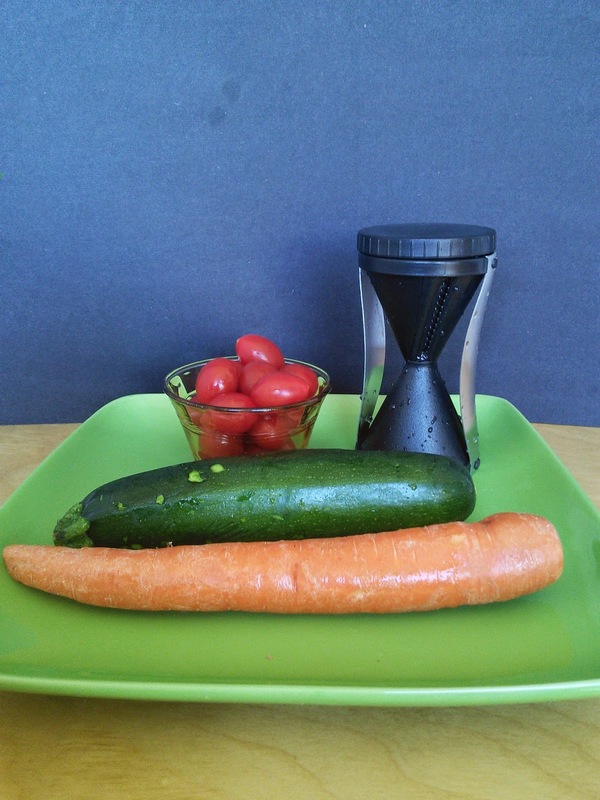 Check out the Spiralizer on their social networks to get great recipe ideas using the vegetable spiral slicer. 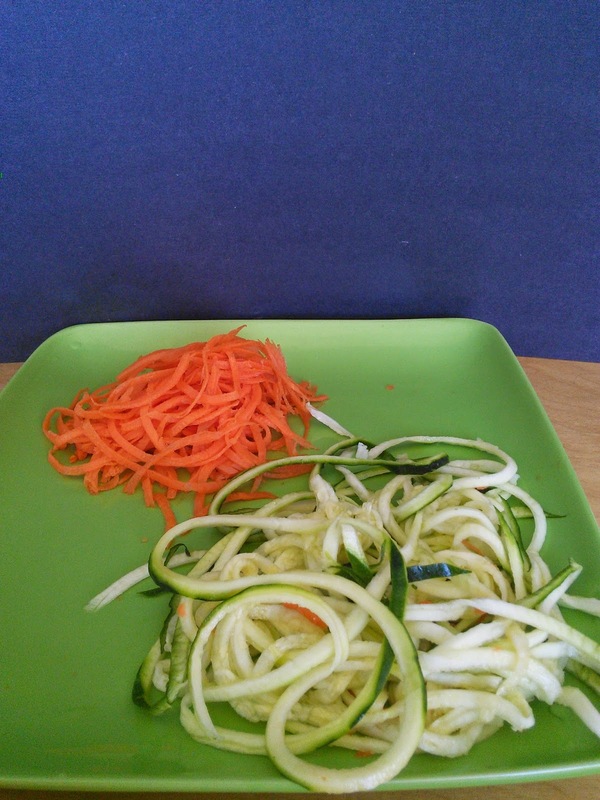 Using the Spiralizer, spiral slice the zucchini and carrot into pasta strips and place in a microwave safe dish. Slice the tomatoes in half and add to the veggie strips. Add the garlic powder and Italian seasoning and stir well. Microwave on high for 2 minutes. Stir and add salt and pepper to taste. Sprinkle with parmesan cheese if desired. Serves 2. Yummmm!! I love pasta and veggies. Win win. That looks delicious!!! Try adding some yellow squash, too! YUMMY! This is such a great idea! Healthy and totally perfect for my husband! Thanks for sharing! This looks so good and what a plus that it's such a healthy dish. I have one of these and LOVE it! It works so easy. I never thought to combine the zucchini & carrots like that. It makes an even more attractive looking dish. Yummy, this looks delicious. I could use one of these tools. I would love this! Will definitely try it. Thanks for sharing. Yum! Your gluten free recipe sounds absolutely delicious. I am so delighted that you shared your healthy and delectable Gluten Free Veggie Pasta recipe with us on the Plant-based Potluck Party. I sincerely appreciate it. I'm following, pinning and sharing.